While she scored many baskets against her classmates in gym by simply shooting over their extended hands, my grandma never played much basketball. In America, basketball wasn’t a big deal back then anyway. There were greater concerns, like the Great Depression. But as a young child, besides swimming, my grandma loved to read. As the local librarian used to say to her, “Agnes, I think you’ve read every book in here.” And if her face wasn’t in a book, it was in water. My grandma said she learned to swim before she could walk. Those childhood days were soon gone. My grandma was intelligent, but she couldn’t go to college because her family was too poor. She married at a young age and stayed home, taking care of my mom, Judy, and my Uncle Rob while my Grandpa Bill worked. Sports were enjoyed in my grandma’s house, but it was seen as a form of exercise, nothing to get excited about . . .
People change with time no matter how set in their ways. My grandma was no exception. Growing up in Danbury, Conn., basketball was a sport my family took seriously, especially my dad, Jack, my brother, Jaime, and I. As soon as the cool autumn breeze grabbed the bright yellow and red oak leaves from the neighborhood trees, University of Connecticut Head Coach Jim Calhoun and his boys up in Storrs, Conn., became a frequent subject of dinner conversations. “Husky-mania” was in our veins, and no one’s blood was thicker than my Grandma Agnes. Yes, my grandma loved watching the Huskies basketball team play just as much as anyone in the Nutmeg state. She, however, became a Connecticut fanatic later in life, soon after my Grandpa Bill passed away on Dec. 7, 1991. At the time of his death, my grandma had been married to him for 49 years. This wasn’t easy for her, but she found an escape. Watching basketball games gave her a new joy, something to bring a smile to her face – something to make her forget about her Bill. At this time, I began to play organized basketball. My grandma never seemed to miss a game. I found out just how serious a fan she had become when I called her during a regular-season Husky game and she did not pick up the phone. She didn’t watch the games like most women over the age of 80. In fact, she sometimes didn’t watch parts of the games, leaving the room during a close game. When the games were tight she sometimes couldn’t take it, either could her high blood pressure. 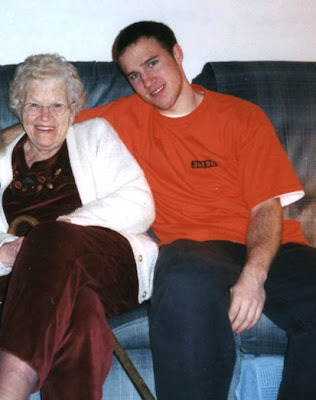 During holidays or weekends, my grandma came to our house and watched the games on our livingroom sofa with me. One game, against Syracuse, I remember vividly. I was sitting on the sofa with my grandma watching the game as she kept blurting out instructions and cheers to the Connecticut players and Calhoun. The game was close down the stretch with both teams trading baskets on offense. My grandma had the palms of her hands together with her fingertips touching her bowed forehead as she whispered to herself. The game was still close. She went back to her position. The Huskies won. Even without basketball, my grandma and I always had a tight bond. Countless times she came over to our house with yogurt pie and green Jell-O, two of her special recipes. We joked around for an hour or two after dinner. I can still remember her talking about her swollen leg, which she injured trying to get into a van to go see me play a high school basketball game. “You also might be able to sell some and make some money on the side,” I said. “I think I might try that,” she said. We both burst into laughter. Even in pain she had a great sense of humor. From fourth grade to my senior year in high school my grandma never missed one of my basketball games. After I graduated high school, she said she missed watching me play. Her love for Husky basketball continued. In 1999, Connecticut beat Duke in the national championship game. Before I ran around the house in excitement, I called my grandma. I asked her what she thought of the game. There was nothing she had to say. I had a good idea how she felt. It was the team’s first national title. My grandma was 85 years old. Thankfully, that title game came when it did. On January 30, 2001, there was no more Husky-mania in my grandma’s house. That weekday morning my mom called me at my school apartment and gathered enough courage to spill the news. My grandma had passed away. A few seconds after I hung up the phone I couldn’t see. Tears flooded my eyes like a dam. I still watch basketball on television, but the game hasn’t been the same.